For a young piano student, who may be practicing independently, remembering to work on several different piano activities at home can be difficult. And as a result, “practice” often consists of opening a book to a favorite piece and playing it over and over all week. Which isn’t really practice at all. 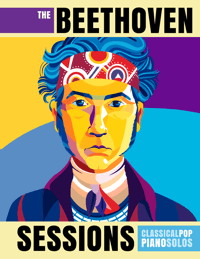 Effective practice involves going over everything that was covered in a lesson, and results in students who sight-read regularly, remember theory concepts, maintain old pieces that can be played “anytime, anywhere”, and practice their technical work diligently. And the key to supporting effective practice at home is helping your students remember everything that needs to be practiced. 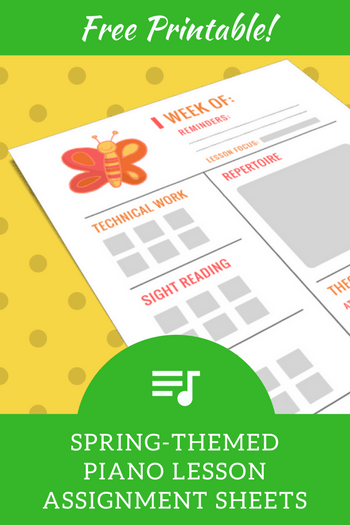 So, today we’re sharing some spring-themed lesson assignment sheets that will motivate your piano students to read their lesson notes and organize their home practice. They’re cute, easy-to-use, and simple enough to be accessible to young students who may not be reading independently. Today we have two printable packs for you. One download contains three spring-themed lesson assignment sheets for your piano students who need assistance in organizing home practice. 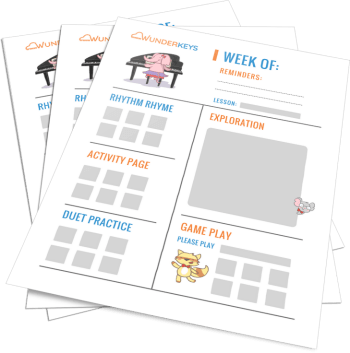 The other download contains three WunderKeys-specific lesson assignment sheets for teachers who want to provide piano parents with assistance in structuring their preschooler’s home practice. Instructions for accessing both downloads are at the bottom of the page. In the “Exploration” section suggest extension activities that parents can perform to reinforce the lesson topic. For example “Count socks – can you make two groups of five?” or “Play and count the groups of three black keys on your piano and write the number here” or “Show your Grandma how to find high sounds on the piano” etc. 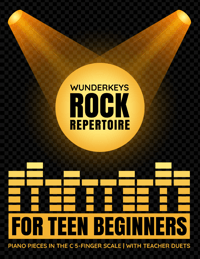 The various sections of the sheet indicate the parts of every WunderKeys lesson that parents can review with their child at home (Rhythm Rhyme, Activity Page and Duet Practice). 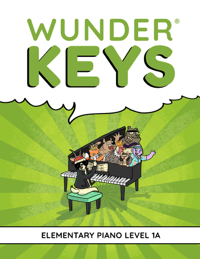 Want to see what these parts of a WunderKeys Preschool Piano lesson look like in our new 2nd edition books? 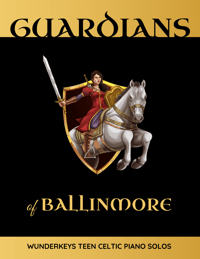 Check out book previews here! In the “Game Play” section write the name of the WunderKeys cut-and-play game that you would like your student to review at home. Instruct parents to add a check mark each time the game is played. Record any relevant information in the “Reminders” section. Ask parents to review the activities as indicated in each section. Have them place a check mark in the appropriate box on the lesson assignment sheet each day they engage in a specified activity. Indicate the date at the top of the page. Record the week’s “lesson focus”. I like to keep track of the main “theme” of each lesson so that my students and their parents are aware of key concepts being learned. Examples of this can include “recital preparation” or “phrasing” or “recognizing intervals”. Instruct your students to place one check mark in a box in each of the three sections (technical work, sight-reading, and review) as they complete their daily practice. Record theory tasks in the “Theory” section (either playing a piano game at home from your lending library, completing score study activities, theory activities etc.). In the “Repertoire” section, write the assigned pieces for the week as well as any notes you want to include about each piece. 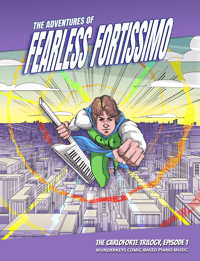 These sheets are intended to be “short and sweet” with limited amounts of writing required for the teacher and therefore, limited amounts of at-home reading required for your young piano student. 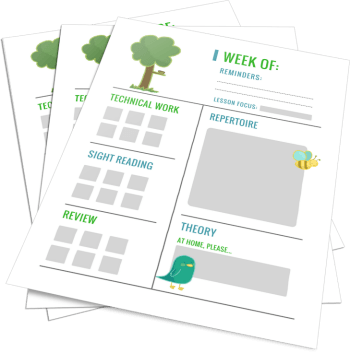 These new lesson assignment sheets (both WunderKeys and Spring-Themed) can be found in the resource section of WunderKeys.com. 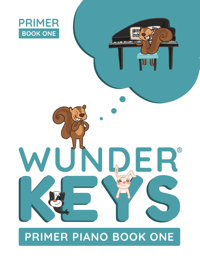 Find the WunderKeys sheets under the “Preschool” section (look for the teal cover featuring Pointer Panda) and the Spring-Themed sheets under the “Level 1” section. 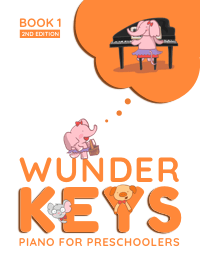 While you’re cruising around the WunderKeys site, be sure to download the other printables we’ve added to correspond with our preschool piano program as well as the upcoming Primer and Level 1 WunderKeys method books! Click here to visit the resources page to download.